The Champion Sports Tennis Racket Set is ideal for beginner and youth tennis games. 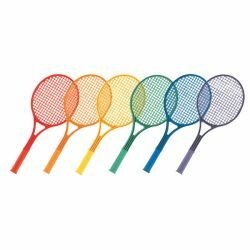 These rackets can be used with a variety of foam or plastic balls for indoor tennis or other rainy day activities. Made of plastic, these 21" brightly colored rackets come in a set of six.